It is not always easy to find fellow Pericles players – especially for live game, so in such circumstances Internet is of great assistance. And here Vassal and its modules are one of best to use. Having this in mind, I joined Play By Email game organized by Brent – we actually used a Dropbox for storing the saves, and ACTS for communication. Worked very well! 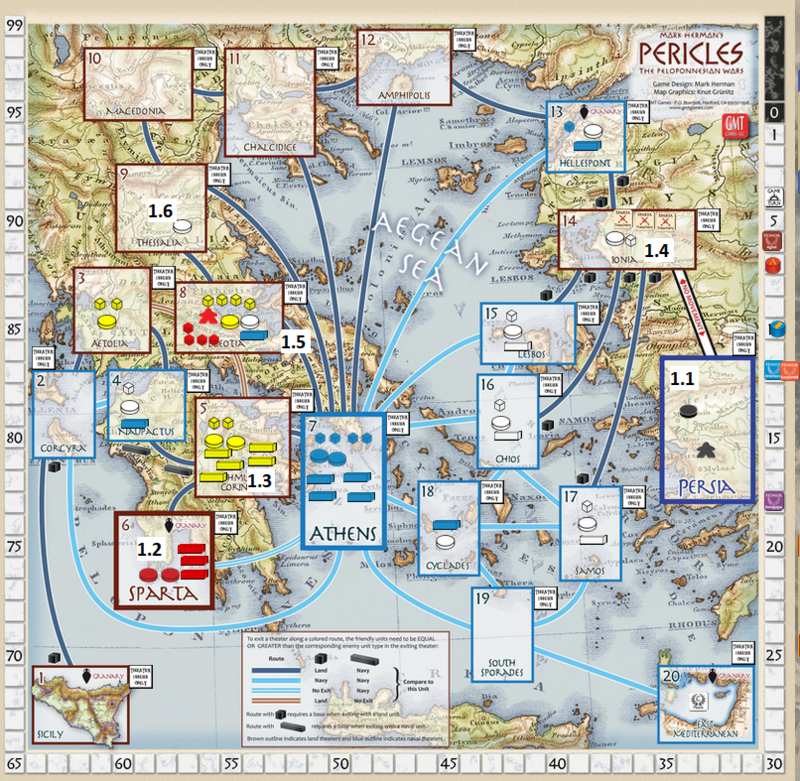 As for majority of us this was first Pericles Vassal game (for some first at all) we have chosen short, two-turn scenario: 14.1.04 A “Periclean Peace”. That is enough complicated to have fun from game but on the other hand not overly long/complex. We started in mid-December end finished by the end of March. So, let us begin the session report! The initial Aristophanes card was Frogs C – that actually has a pretty big impact on game: we got Ostracism issue for debate, minus 6 strategos for each side and on top of this – Alcibiades went to Persia. That was an opening allowing for a lot of possibilities for the turn! In Assembly phase both me and Brent have won the respective debates, gaining 3 honor each. The amount of won issues was one more on Sparta side. Well, it might not be obvious from the map, but raids were devastating. Very – especially once you run out of strategos (which we did, thanks to Frogs C card). Is there any chance for Sparta to turn the tide? Let us see. 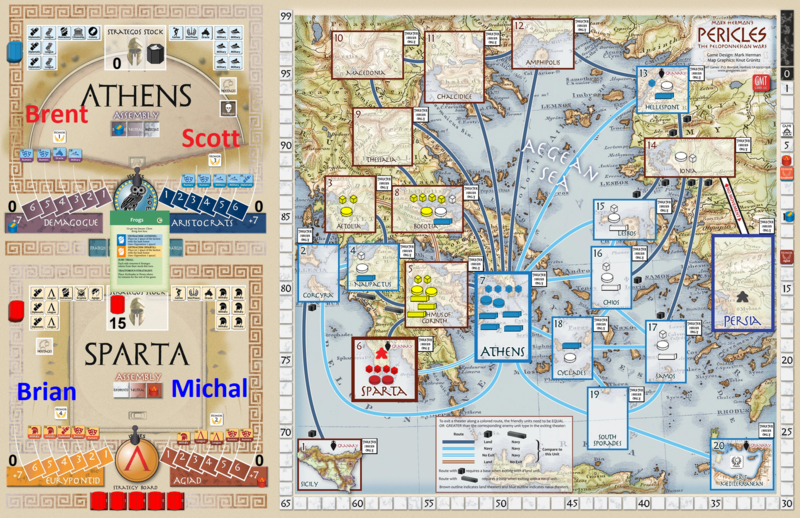 So we start with new Aristophanes cart – this time Knights B – not a game changer, as it adds one military issue to each side and deducts 6 strategos from both City States. The assembly phases are again won by Agaids (me) and Demagogues (Brent) but very important development occurs – due to the negotiations, and – apparent – lack of agreement – Athens will enter the Theater phase with only four “real issues” (I do not count rumors) while Sparta will have eight, including four military. Sounds like interesting turn! 2.1 – very cleverly Brent avoids any danger in Ionia by simply using the Citizenship issue and turning the base into Athenian one. No more diplomacy from Sparta there – that does not make sense. 2.2 – Thessaly base of Athens becomes Spartan one – good diplomacy is a key! 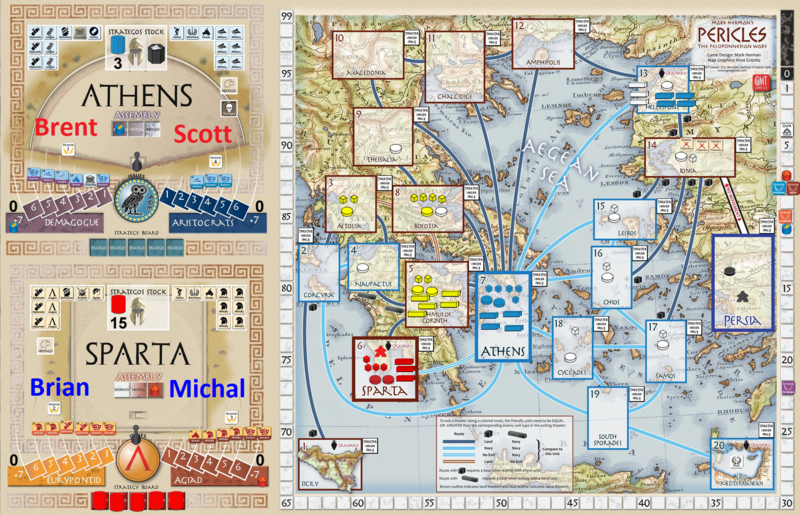 2.4 – …due to my mistake (or rather, me forgetting one key rule) only small forces of Sparta are in Boeotia, and with last military issue, Athens are able to win a battle there, take hostages and win the game! That was a very great and enjoyable experience! First of all, the game itself – so thematic and interesting. Second, fantastic co-payers, from whom I was able to learn a lot. 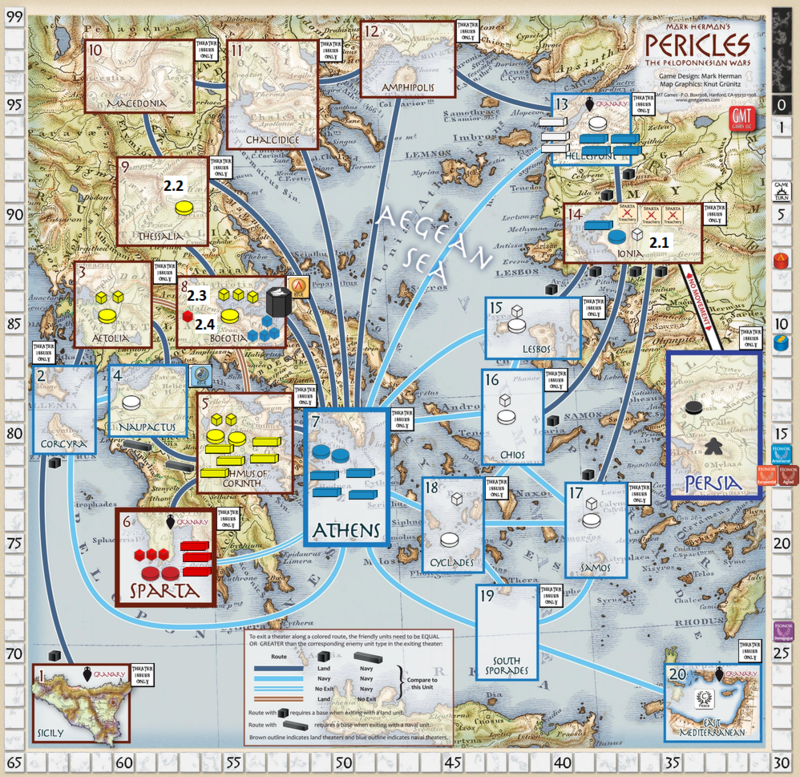 And only one thing did not allow me to have full satisfaction – fact, that when victory so was close, it slipped away to Athens 🙂 But the learning will not be forgotten and I hope I will be able to use it in one of future Pericles games! Great writeup! It was a fun game – I enjoyed gaming with you gents. Any time! Thanks! Hope to play with you in the future! I play a lot of games on live Vassal/Skype. These days, it’s the only way I can go against live opponents.